Kosher MREs Rushed to USS Ship. 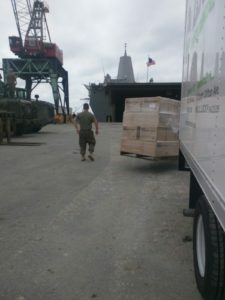 Labriute Kosher MREs loading to a USS Navy Ship. When one of our incredible USS Navy ships is about to sail to the Middle East and kosher meals are not on board, Labriute goes into action. We received the call late Friday about a Navy ship that was sailing the next day. With Shabbos around the corner, all we could do is wait until Saturday evening, then we deployed Operation Kosher MREs; we opened our warehouse, loaded a truck with a few thousand meals and two of our employees drove through the night for nine hours to meet the ship. Labriute is the exclusive supplier of kosher meals-ready-to-eat (MREs) meals to all branches of the military and National Guard.